Not thinking pink? Try four other colors. Most people shovel their meals into their mouths too quickly for their bodies to process, which means the stomach still feels hunger even though it’s full. HAPIlabs’ electronic HAPIfork vibrates when you eat too fast, reminding you to slow down. The HAPIfork measures the length of time between bites, and how long it takes you to polish off your meal. 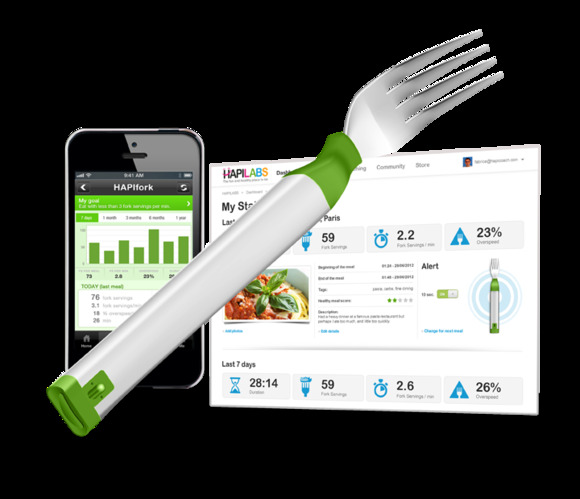 The fork contains a USB drive that stores the information on your eating patterns so you can download it to the HAPIlabs app. The program also offers food coaching so you can change your eating behaviors. The electronic fork doesn’t count calories, so if you’re eating a pile of chocolate chip pancakes very slowly, it won’t vibrate or advise you to ditch the sweets and switch to egg whites. HAPIfork was one of the breakout stars at this year’s International CES, mainly due to its novelty. The fork is the first smart utensil on the market. HAPIlabs also has a standard activity tracker that clips to your belt or fit in your wallet for a more well-rounded health analysis. Both products are currently only available to preorder. The prices are unknown.